In 1961 the world’s first manned space flight of the Soviet cosmonaut Yury Gagarin generated unprecedented enthusiasm about space exploration. Rocketry and media made a perfect collaboration to entertain and inspire the public. Science fiction books and films were of huge demand. Astronomers, pilots and space experts suddenly grew specially respected. Now, fifty years later public awareness about space travel is on the rise again. US-Soviet space race in film industry. Soviet films on space travel were patriotic although a bit naive. 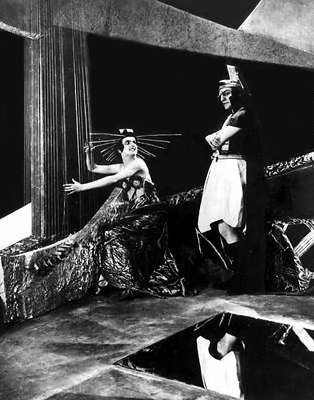 One of the first in history black-and-white silent full-length feature film Aelita: Queen Of Mars was released in Moscow in 1924. Directed by Yakov Protozanov it was an unprecedented show of science fiction elements. 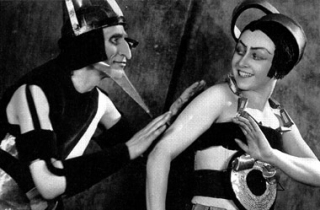 Besides, it was the first eye-opening space love story: Queen Aelita fell in love with Russian young cosmonaut as she was watching him through a telescope during his space flight to Mars in a rocket. I m p o r t a n t l y, now the film is in public domain. Hollywood responded later but more successfully with big budget science fiction films in 1930-1940s. Later and in recent decade it dominated in global film industry with blockbusters The Mission to Mars, Star Wars, Star Treck, Fifth Element and recent box-office crasher Avatar. One of the major Russia’s highlight among science fiction films was Solaris by Andrei Tarkovsky. This meditative psychological drama occurring aboard a space station orbiting the distant planet Solaris won the Grand Prix Spécial du Jury, the FIPRESCI prize and was nominated for the Palme d’Or of the 1972 Cannes Film Festival. In 2010 a Russian full-length computer-animated film Belka And Strelka, Star Dogs was released. 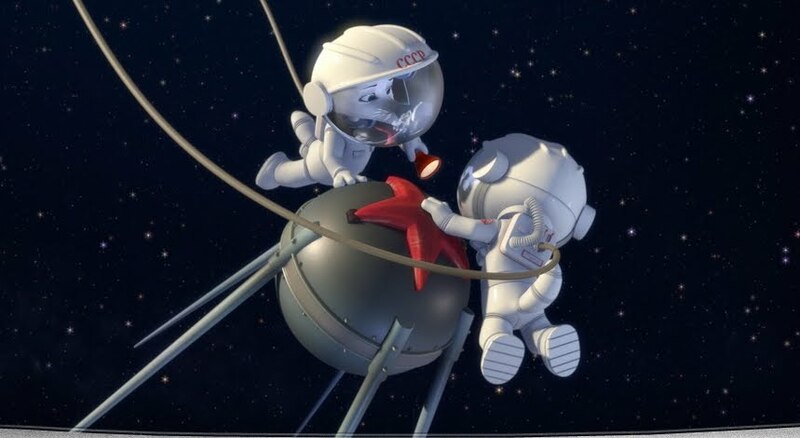 It was based on early space exploration history episode of the first dogs who survived an outer space trip,. Instead it features a circus dog Belka and a mongrel dog Strelka who join a space animal team and take a spectacular space flight. NASA ignores Soviet/Russian space missions. Recently NASA launched a special historic space movies and information report. It has ignored most Soviet and post-Soviet space missions to show USA as the ultimate winner in all space flights. It looks as if the cold-war space race has never ended. However, NASA took a balanced position to admit among the worst Hollywood movies Armageddon and Moonraker. UK fantasy book about Gagarin. A few days ago Spaced Design publishing house in UK released a graphic novel “Yuri’s Day: The Road to the Stars”. Regretfully, it portrays Yuri Gagarin first as a global idol of the 20th Century respected and adored both in the Soviet Union and worldwide and then as a person who was strongly disillusioned with the Soviet system. Former Soviet cosmonauts who knew or remembered Gagarin indignantly called this publication ‘a disgusting lie’. The novel also describes the leading Soviet space engineer Sergey Korolev who headed the construction of the first Soviet Sputnik and piloted spaceships including Vostok 1 for Gagarin to orbit the Earth in a 108-minute long flight. In 1938, Korolev was arrested during Stalin’s purges and spent six years in the GULAG. All these facts are hard to deny. International co-productions shot in Russia in 2011. Michael Bay’s Transformers 3 (USA) and Cosmonaut (Spain) will be among the first science fiction features partially filmed in Russia. Thanks for your helpful response. I hope people in the countries of the former Soviet Union will get to know our book better, and see that we have presented a more truthful picture of our subject than some of the publicity suggests. We have been amazed and humbled by the amount of interest from Russia, and are actively seeking a Russian translator who can help us to produce a high quality Russian edition, and at the same time, help us to avoid some of the mistakes we have made in our advertising. As editor of our website I can’t ignore the reaction of ex-Soviet space industry people and cosmonauts who sincerely called ‘a disgusting lie’ that Yuri Gagarin was allegedly ‘strongly disillusioned with the Soviet system’. I doubt, that people, who worked with Gagarin and remember him, have been able to read an English edition of “Yuri’s Day: The Road to the Stars”. I think they were rather disappointed with some snatches from Russian translation. Anyway, I also can’t believe Gagarin was ‘disillusioned’. Of course, he knew a real life of an average Soviet citizen. But when he became a public figure as Cosmonaut # 1 he started to enjoy high-life conditions like most Soviet elite. As story editor and illustrator on Yuri’s Day, it is distressing to hear that it is being called a ‘disgusting lie’ by people for whom we have the greatest respect. Perhaps the wording of our publicity material is too excited, and does not give a clear impression of the real book. In one frame, on one page, the story notes Yuri’s concern when he hears how the state once treated his boss and father-figure, Sergei Korolev. Throughout the rest of the story Yuri is portrayed as a loyal and enthusiastic Soviet citizen and a great ambassador for his country. Both are based on careful research. We strongly felt that Yuri’s story does not have the attention and respect it deserves in the west. A graphic book such as Yuri’s Day has to tell that story in a very simple and dramatic way, but we hope it will lead a new generation to want to know more, and to discover for themselves the complicated issues of Soviet history, and the extraordinary achievements of its space pioneers.